Owen Hazel of Jannettas talks to school pupils about getting into hospitality. One of Scotland’s longest established ice-cream institutions is on a mission to attract more youngsters into the hospitality industry. 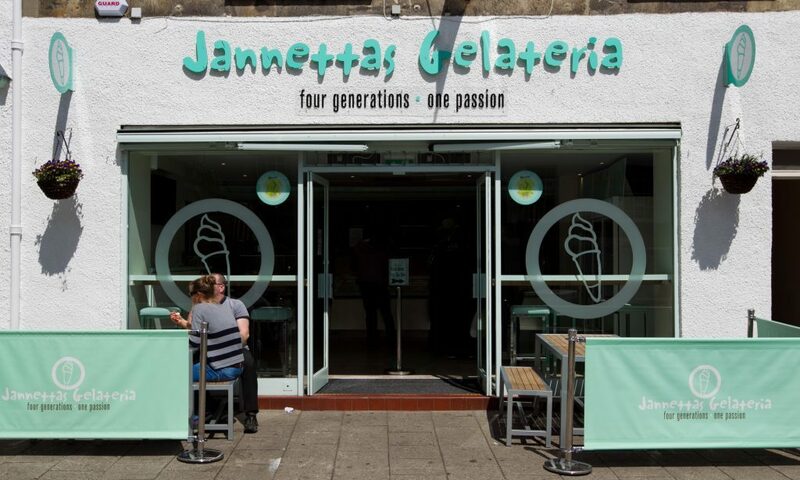 Jannettas Gelateria in St Andrews is taking part in the ‘Taste the Industry’ schools roadshow run by Tree of Knowledge and Tennent’s Training Academy. Having already transformed the minds of some sceptical pupils who attended an event in Cupar, the roadshow headed to Gracemount High School in Edinburgh on Wednesday. Taste the Industry is made up of interactive masterclasses delivered by local employers. They transform schools into a mock hotel, restaurant and bar to give pupils a first-hand experience of the hospitality industry. Owen Hazel, co-owner of Jannettas Gelateria said: “When we attended Bell Baxter High School in Cupar, we asked how many pupils hoped to enter the hospitality and tourism industry when they leave school. “Only nine out of 100 responded positively. However, by the end of the day that number had rocketed to a staggering 76! “Unfortunately some pupils are being dissuaded from entering this industry as they don’t realise its true potential as a source of some amazing and exciting jobs. Owen said he had a “brilliant day” with the pupils in Edinburgh this week. “Once again, the day began with a very small number of young people actually looking to pursue a career in hospitality and we’re delighted to report that we converted the great majority of them! “Some had preconceptions about hospitality, thinking it was a career restricted to waitressing and cooking. “However, hospitality is much broader than that, and is all about dealing with people and giving them a good experience, contributing to their day positively. “We’ve been meeting some pupils who would make fantastic contributions to Scotland’s hospitality industry, an industry which is growing and offering great financial and personal rewards to those who contribute to its success. “Collectively, we opened their eyes to the careers which are open to them across Scotland, and the huge professional and personal benefits of working within hospitality and tourism more generally. “As a fourth generation business, my wife Nicola and I wouldn’t run Jannettas if we didn’t love it and we feel that our passion rubs off not only on our staff but on the thousands of customers we serve each year. Jannettas hope to be involved in future similar events with schools. 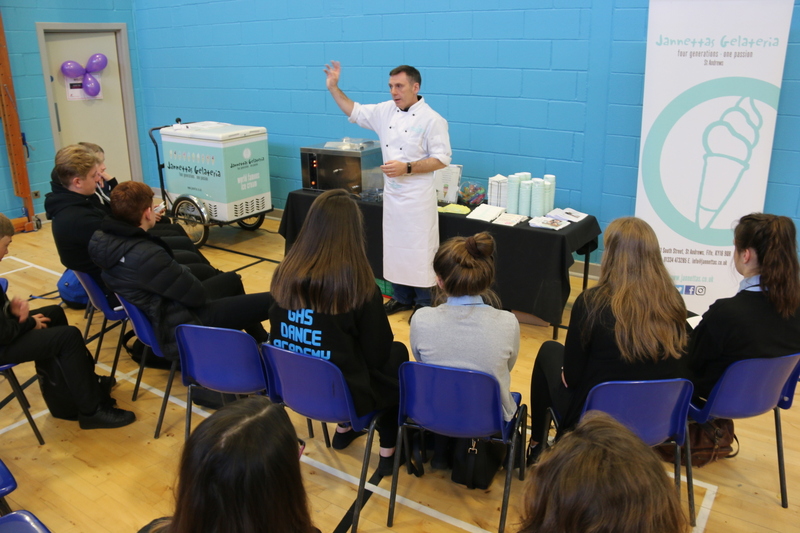 The Taste the Industry events aim to broaden pupils’ understanding of their own transferable enterprising skills, which can be put in practice in their future employment. For employers, the events are an opportunity to create a talent pipeline of young people keen to gain work experience within their organisation. Taste the Industry is an exciting project, which aligns with the outcomes of the Curriculum for Excellence and Developing the Young Workforce. It also has the potential to address local youth unemployment and improve the School Leavers’ Destination Report whilst meeting the demands of the hospitality sector. Dougie Clark, a director of Tree of Knowledge, said: “We’re delighted to be part of this exciting programme of events across Scottish schools. Stephanie Wade, director of the Tennent’s Training Academy, said: ‘’The hospitality industry is a great way to make friends, travel and earn extra cash during studies but, more importantly, it is a very rewarding, fast- paced career. “There are a whole host of opportunities on offer in every corner of the world, from jobs in tropical beach resorts in the world’s most remote islands, to high flying (and paying) executive director roles in every city in the world!